6 Inch record pressed by RCA plays at 78rpm. DON DAVIS "Can There Be A Time?" WCKY was in Covington, Kentucky. I guess the WCKY Jamboree was some kind of a barn dance show. The station also had the Liberty Theater Barn Dance at some point. playing records from 8:05 to midnight every night. He was voted the top hillbilly DJ in the country for eight consecutive years. 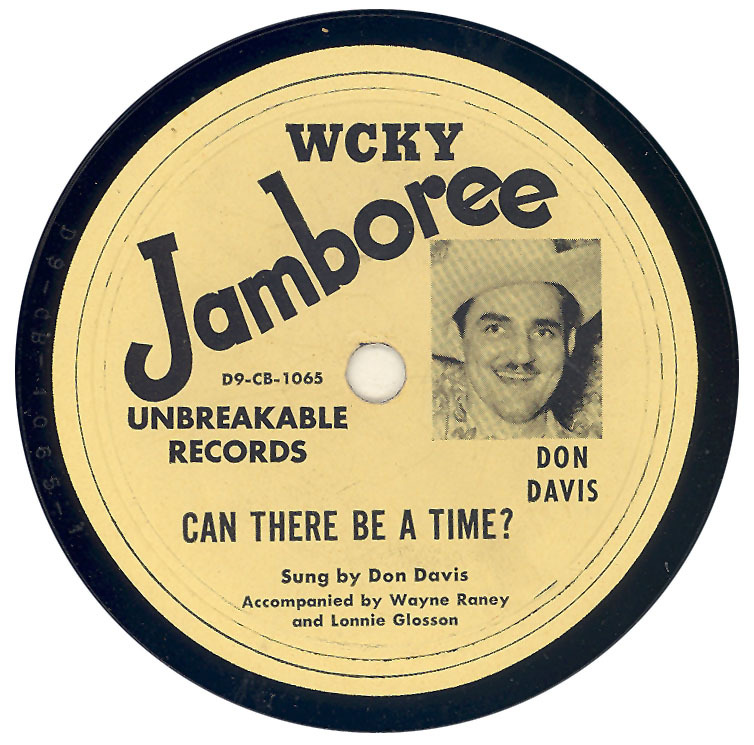 Don Davis came along later and DJd from midnight to 1:00 AM after the Jamboree. In 1961 WCKY began broadcasting the live WCKY Ohio Jamboree from Madison Lake Park in London, Ohio with Clay Eager as the emcee. I enjoyed listening to the Jamboree each night as a teenager but never sent in any penny postcards for any of the advertised products ( one of the first places you could buy paint in a spray can!). I also never understood why, when announcing the address, they would carefully spell out W C K Y. If the listener couldn't handle that, how in the world was he going to spell Cincinnati 1 Ohio? I am looking for a rare bit of information. Back in the late 1950's, my parents would listen to WCKY-AM at night. I was 8 - 9 years old at the time but there was a DJ on this station that used "Steel Guitar Rag" as his theme song. I have been looking for the artist that made the recording that he used because every version I hear now does not match my memory of the one the DJ used. Does anyone have a clue as to who the DJ was or the artist who recorded the theme song. Back in the forties, WCKY was my favourite. I could only hear the station at night when the signal skipped. I am in Windsor, Canada, across from Detroit, Michigan.